The southern approach track into the Bisti Wilderness Area (county road 7000) descends quickly through a thin band of black and yellow badlands to the wide valley floor, an area generally lacking any hoodoos apart from an interesting region on the west side of the road, just beyond a cluster of orange and grey mounds. The whitish sandstone formations hereabouts are not very large and extend for only a quarter of a mile but they are nicely-shaped, and quite densely-packed. In some parts the white rocks sit on top of a layer of black coal, creating a stark color contrast. Annotated topographic map of the Bisti Wilderness Area. The vast majority of the badlands are on the other side of the road, however - walking east from the trailhead, the rather featureless black-yellow hills bordering the south side of the valley persist for some way, becoming more extensive, as orange mounds near the streamway add a little variety to the color. 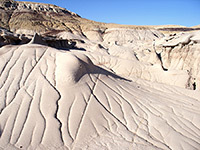 A sizeable wash joins the valley from the south after half a mile, lined with a narrowish group of small hoodoos (panorama). The next good area is a reddish promontory on the northeast side of this wash (marked 5797 on the topo map), the far side of which overlooks another large wash, with a big, flat, black area in the middle and lots of eroded formations along the edges, and especially along a tributary on the east side. Back in the main valley, the land is rather barren for a while though still with small formations (panorama), then after another orange mound the next tributary ravine also has an extensive narrow band of small but interesting hoodoos, rising quite high, above a thick black layer. Past the next promontory are the cracked eggs - swirling, egg-shaped sandstone boulders scattered over a flat area close to the main wash channel. 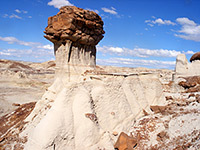 East of here, the land breaks up into many shallow ravines and narrow ridges, with countless pinnacles and balanced rocks (panorama), and much petrified wood including at least two tree trunks over 30 feet long, and plenty of hoodoos where the caprock is a piece of the fossilized wood. This is the best part of the south side of the valley. 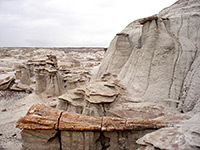 There are a few more groups of hoodoos to the north, though further east, the land becomes barren, as steeper gullies form between hills of yellow/brown/grey mud, mostly without any eroded rock formations (panorama). A leisurely walk to and from this point takes around 4 to 5 hours. Hoodoos in this section of the badlands are mostly smooth grey caprocks above white pillars - simpler and less colorful than the formations further north, but there are many dense and intricate areas, and larger pieces of petrified wood. 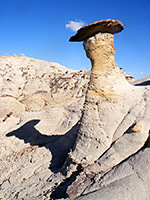 The land southeast of the northern trailhead parking area near Bisti Trading Post is mostly undulating badlands, orange in places, yellow-black in others, and has only occasional, scattered hoodoos. The hills rise higher further east, forming a ridge separating the main drainage through the wilderness (Hunter Wash) from the next valley to the south. The low cliffs forming the northern edge of the badlands, beyond Hunter Wash, have a thin but extensive line of hoodoos, though the larger region between the two valleys is more interesting, and the best section is on the south side of the ridgeline, starting about one mile from the trailhead. Many ravines cut into the banded mud hills, some quite deep and steep-sided, and the irregular terrain makes it hard to describe any particular route. One especially nice area of densely spaced hoodoos is found just east of the 5840 contour line ('hoodoo garden' on the topo map) - this has several closely-spaced lines of weirdly-shaped sandstone formations, colored white to brown. Most of the rocks south and east of here consist of dark brown blocks on top of narrow, light grey ridges (panorama), often forming small arches - generally more complex and varied forms than the grey/white hoodoos along the south side of the wilderness. Beyond these rocks, and due south of the hoodoo garden, is a big flat area dotted with all kinds of curious rocks, from small red pebbles to fantastically-shaped and eroded boulders, some similar to the cracked eggs to the southeast. 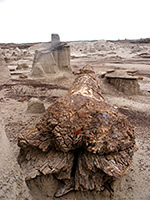 Petrified wood is less abundant than further south but still quite common, more so to the west, near the parking area, including a few remnants of upright tree stumps.